Yabbadabba-What? These Aren't The Flintstones You Remember When you say The Flintstones, most people think of the old Hanna Barbera cartoons. 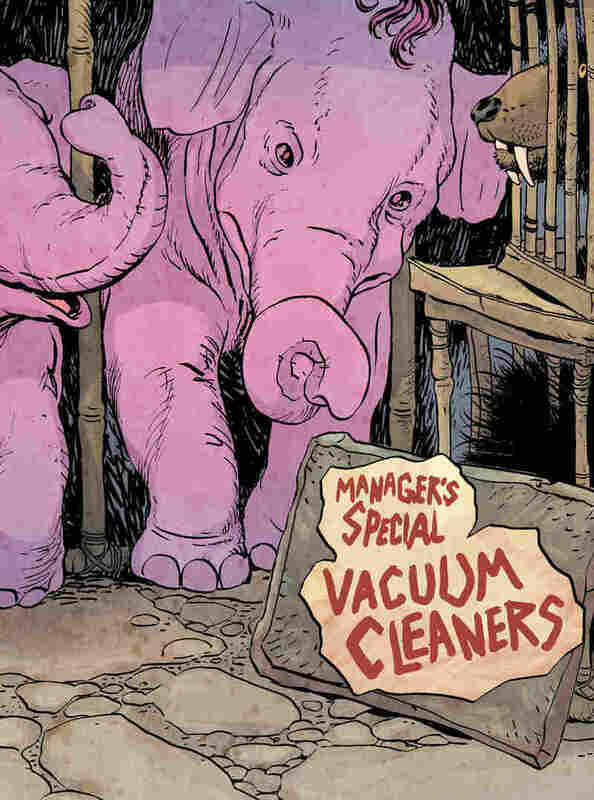 But a new comic book adaptation keeps the humor, and tackles some heavy themes like capitalism and human frailty. 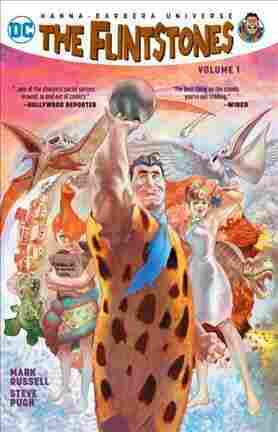 One of the freshest reboots in the world of comic books is based on a kids show that debuted back in the '60s: The Flintstones. But this isn't the "modern Stone Age family" you might remember from your childhood. Writer Mark Russell says he's gotten a lot of raised eyebrows in reaction to his version of The Flintstones. "I don't know if this should be a mark of shame or a mark of pride, but I feel like every positive review of The Flintstones kind of begins with an apology, like 'I know you're not going to believe this,' or 'Please don't hold this against me, but I really liked The Flintstones.'" Russell himself wasn't sold right away either, he says, "but the more I thought about it, the the more I thought well, The Flintstones is kind of the perfect platform for me write my feelings about the fundamental errors of civilization." And that's on-brand for the 47-year-old writer. In the past, he's published a somewhat absurd retelling of the Bible called God is Disappointed in You, and his comics work is mostly satirical, poking fun at politics, religion, and cultural institutions. "I consider human history to be a comedy," he says. "That's largely what it's about. Earth: A dark comedy." But before he could tackle that dark comedy, Russell says, he "really wanted to start with the characters and make them relatable and sympathetic, because they're basically just living their lives." He credits artist Steve Pugh with bringing humanity to his characters: "You can see the personalities, really, in their design. Fred's a big beefy guy, looks like he played football in high school and has kind of let himself go since then, but he's got a lot of love and sadness in his face." The more I thought about it, the the more I thought well, 'The Flintstones' is kind of the perfect platform for me write my feelings about the fundamental errors of civilization. Fred's an Everyman in Russell's Bedrock, a veteran who's haunted by his actions during the "Paleolithic Wars." And remember his famous "Yabbadabbadoo?" Russell "sort of turned it into a nonsense mantra to help them deal with PTSD and stress of everyday life." Russell says he was able to bend and twist the Flintstones' world because he didn't have a lot of childhood nostalgia for the cartoons. "Nothing was sacred, in fact, that was kind of my mission. This was not going to be some reverential homage to The Flintstones." So Fred works for a terrible boss at a terrible job, trying to make just enough money to afford the latest household appliance. Or, as Russell calls it, "the exploitation of animals as free labor, which to me it's like they're the interns of the prehistoric world." Russell says he remembers being horrified as a child by the fact that a camera in the Flintstones' world was a bird whose only purpose in life was to chisel a picture into some rock. To emphasize that horror, Russell often makes a point of focusing on the animals, giving them personalities and inner lives, but not names; the animals refer to themselves as garbage disposal, coat rack, vacuum, and they struggle to find meaning outside of their assigned purpose. "They just conceive of themselves as their function, sort of — not too subtly — a commentary on us and how we think of ourselves." "The meaning that you get from your life is not going to be what you find from your function, or from how good you are at the job you've been assigned in life," Russell adds. "It's really about the strength of connections you form with your fellow appliances." The rest of the Flintstones gang — Wilma, Betty and Barney, Pebbles and Bam-Bam — are there too.Their relationships, and the lessons they learn,form the basis for what Russell really wants to say with this reboot of The Flintstones: "Caring for people who mean nothing to us, that's really the goal of human civilization if it's going to aspire to be anything more than just a place to get cheap snake meat, like it is in The Flintstones." For Russell, that means looking at the world and asking, "What could we be doing better?" — and, "How can I make that funny?" This story was edited for radio by Jolie Myers and adapted for the Web by Petra Mayer.